The Spectacled Avenger: Wittgenstein' s Remarks on Frazer's "Golden Bough"
Wittgenstein' s Remarks on Frazer's "Golden Bough"
Ludwig Wittgenstein, Remarks on Frazer’s “Golden Bough”. A. C. Miles (trans.) (Retford, Nottinghamshire: Brynmill Press, 1979). Sir James George Frazer published his masterwork The Golden Bough in 1890. It was a work of comparative anthropology, the aim of which was to explain primitive myth, magic, and ritual. I admit that, having read Frazer, I found myself less than enlightened. Apparently I was not alone. During the month of June 1931 the philosopher Ludwig Wittgenstein was also reading Frazer and was also not feeling enlightened. He decided to jot down some notes, about ten manuscript pages’ worth. These notes didn’t see the light of day until almost thirty years after his death, when they were published by one of his literary executors, Rush Rhees. In my opinion, these intellectual scraps are a greater testament to Wittgenstein’s genius than almost any of his more canonical writings. He finds much in Frazer’s work that is mistaken, and some things he finds plain absurd, but he takes these lemons and manages to make lemonade from them. Generally, Wittgenstein’s main complaint about Frazer’s explanations of “primitive” myth and ritual is that Frazer seems to characterize such phenomena as so many examples of mistaken belief, of bad science. In other words, primitive peoples are picturesque, but essentially stupid. Wittgenstein disagrees with this view, and the general tendency of his remarks is to close the gap between ourselves and the so-called “primitives”. He uses a two-pronged strategy to bring the two sides of the gap closer together, by showing 1. that the “primitives” aren’t that primitive, and 2. that we moderns are more primitive than we would like to believe. Wittgenstein opens this line of argument by noting how implausible it is to believe that primitives do all the things they do out of sheer mistakenness, out of stupidity. How could an entire people be stupid and still manage to survive? “The same savage who, apparently in order to kill his enemy, sticks his knife through a picture of him, really does build his hut of wood and cuts his arrow with skill and not in effigy” (p. 4). And if, as Frazer claims, a rain dance seems effective because sooner or later it will rain, then “it is queer that people do not notice sooner that it does rain sooner or later anyway” (p. 2). “Burning in effigy. Kissing the picture of a loved one. This is obviously not based on a belief that it will have a definite effect on the object which the picture represents. It aims at some satisfaction and it achieves it. Or rather, it does not aim at anything; we act in this way and then feel satisfied” (p. 4). When we moderns kiss a picture of a loved one, which is relevantly analogous to the primitive practices which fascinated Frazer, do we do it because we believe this will have some effect on the loved-one? I should think not. It is not an attempt to manipulate causal processes. Rather, it is an expression of a desire; it is a gesture. Here I believe Wittgenstein had in mind the eighteenth century German writer G. C. Lichtenberg (1742-1799), who wrote about how “when at skittles you try to assist the ball by moving your head, shoulders, arms and legs after it has left your hands: it is more a desire to influence than actual influence” (Aphorisms, Notebook J, #119). 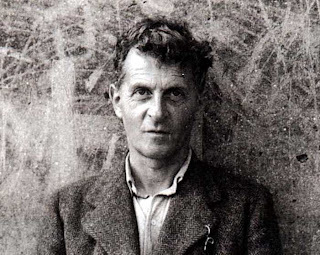 Here is another of Wittgenstein’s examples (p. 10): “I wish to say: nothing shows our kinship to those savages better than the fact that Frazer has at hand a word as familiar as ‘ghost’ or ‘shade’ to describe the way these people look at things.” In other words, when describing “magical” practices, we find ourselves resorting to words of our own language which themselves are magical. The fact that our language has such words standing ready for duty ought to make us wonder whether we are all that far removed from the “savage”. And when we take the trouble to examine our language, we will find many other examples. Why, for example, do we continue to speak of the sun’s “rising” and “setting”, when strictly speaking the sun does not move at all? As Wittgenstein puts it, “a whole mythology is deposited in our language” (ibid.). According to Wittgenstein, Frazer’s whole intellectual endeavour is misguided. When faced with practices that are prima facie bewildering and astonishing, Frazer looks to find an explanation for them. He begins from a premise that seems respectable enough in itself, which is the assumption that the primitives themselves are aiming at some purpose. To put it in the jargon of the modern philosophers of mind, the actions of the natives are intentional. If they have a purpose, then in that barest of senses the actions are rational. The reason that they seem incomprehensible to us, then, is that the primitives have mistaken beliefs about causality: they mistakenly believe that dancing around in a certain way will cause rain to fall. If they only had better knowledge of how things work, they would not need to resort to strange ritual and magical practices. Thus, according to Frazer, primitives are simply very bad scientists. Wittgenstein sees this attempt to explain what the primitives are doing as mistaken from the very beginning. Their actions are not attempts to manipulate causal processes, and so neither are they based on mistaken beliefs. Rather, we should see their actions as a kind of language, but a language of gestures rather than of words. Ritual is not about doing something; it is about saying something. I think Wittgenstein would also want to add that this gesture-language is one that is particularly adapted to its subject matter. There are some things which are too grand, too sublime, or just simply too much to be adequately expressed in words, “the crush of thoughts that do not get out because they all try to push forward and are wedged in the door” (p. 3). Where primitives burn a human being in effigy, Frazer wants to see something sinister in it. He sees it as the survival of some earlier ritual where a real person was burned, in order to placate the gods. Wittgenstein on the other hand sees it for what it is: burning in effigy. We are tempted to see something terrible in it, because the gesture expresses some idea that is terrible, perhaps something about death. And the gesture is lent a certain terribleness by its surroundings: the darkness of night, the occasion of a funeral, whatever. Often what such a ritual says is “this is what took place here; laugh if you can” (p. 3). The edition of this book I have cited is, to the best of my knowledge, out of print. However, the full text can be found in a collection of Wittgenstein’s writings called Philosophical Occasions: 1912-1951 (Indianapolis: Hackett Publishing, 1993). Marcel Mauss: "General Theory of Magic"
Discussion of Mauss (and others) in Charles Taylor's "Secular Age"
Susanne Langer's comments on religion in "Philosophy in a New Key" and and "Mind: An Essay on Human Feeling;" in essence, she regards religion and magic as symbolic forms. Roberto Calasso: "Ruin of Kasch," "Marriage of Cadmus & Harmony" and "Ka"
I read Langer's "Philosophy in a New Key" many years ago. Frankly, I don't remember much about it. Talyor's "Secular Age" is on my shelves upstairs, waiting to be read (which I am now motivated to do!). Some years ago I read a little book by Stanley Tambiah called "Magic, Science, Religion, and the Scope of Rationality" (Cambridge U.P., 1990), which discussed Wittgenstein and Frazer, along with Tylor, Bronowski, Rivers, et al. It was quite good.